A poor farmer scavenger on desert planet Tatooine Jakku longs for more than the life they have… Han Solo is clearly now taking the Obi-Wan mentor role. It’s cool that they haven’t revealed Luke in the trailer (except for his metal hand) or even on the poster. It’s rumoured that the new heroes are trying to find him in the film and that he only appears towards the end. But the conspiracy theorist in me wonders if it’s in part because Mark Hamill himself looks so different that it’d be all the general public talked about. It’s certainly exciting stuff, and I can’t wait to see it. I wonder when the hype dies down and the film has been out for a few years that people will say it played it too safe, bringing back all the things I mention in the first paragraph virtually unchanged and following the plot points of A New Hope pretty closely. At least Lucas did something completely different with the Prequels (not that I have any love for The Phantom Menace). 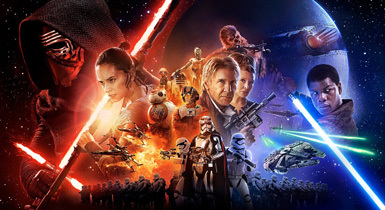 Star Wars: Episode VII – The Force Awakens opens 17th December in the UK, 18th in the US. I think it will pan out like all JJ Abrams’ movies. It will be entertaining and then doubts will creep in. The prequels may have been disappointing, but there is something more cynical about JJ Abrams’ approach. His stuff feels calculated to hit the right fan buttons. However, they’re sort of pod people movies. They look the same, they sound the same, but really they are cinematic vegetable based replacements.